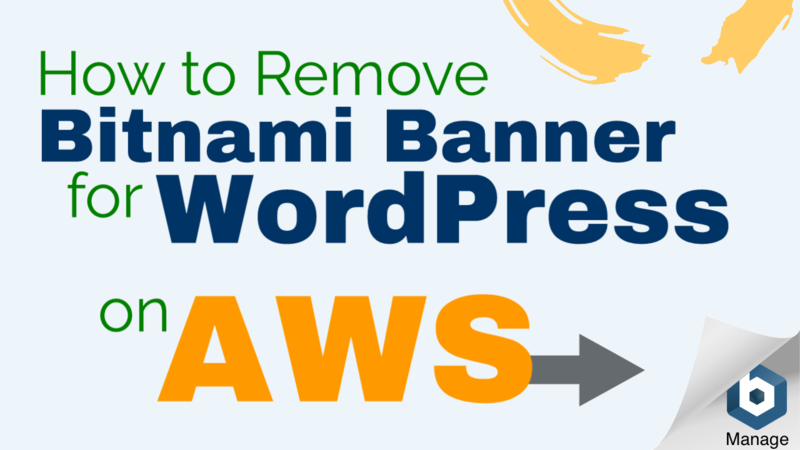 In this tutorial I will show you how to remove the Bitnami corner banner that appears on your WordPress site after installing WordPress on Amazon AWS. Before getting started with this tutorial, you should have already installed WordPress on Amazon AWS. 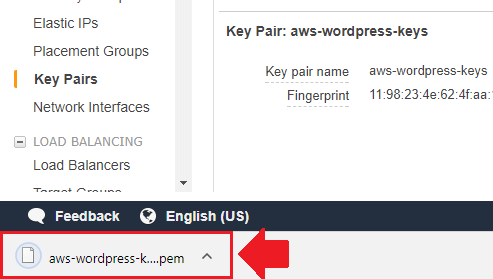 For instructions on how to install WordPress on AWS, check out this tutorial. For instructions on how to remove the corner banner once and for all, using the proper method, then follow along with this tutorial. From your AWS dashboard, navigate to EC2 under the Compute column. In the left sidebar column, navigate to Key Pairs under NETWORK & SECURITY. 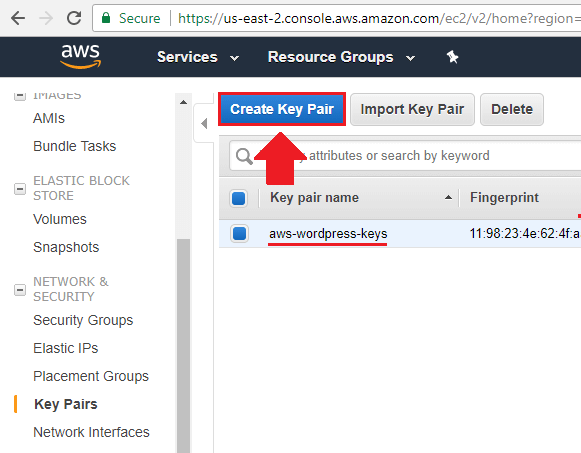 Click the Create Key Pair button at the top of the Key Pairs page. Save the downloaded key file in a secure location on your computer. 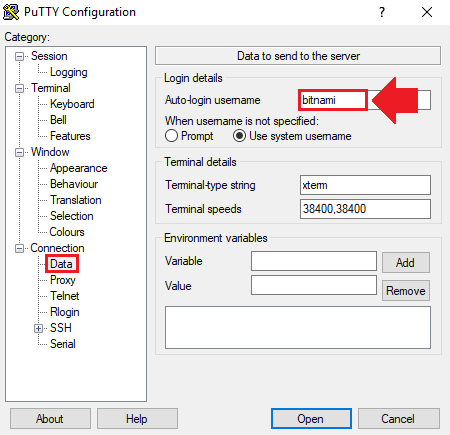 Open the PuTTY Key Generator application (PuTTYgen), and click the Load button to upload the key file that you downloaded in the previous step. Next, click the Save private key button. Make sure to save the file with the .ppk extension. Next, open the PuTTY desktop application. This is a different application from the PuTTYgen application that was used in the previous steps. Enter your EC2 Instance’s public IP address in both the Host Name and Saved Sessions fields, then click the Save button. 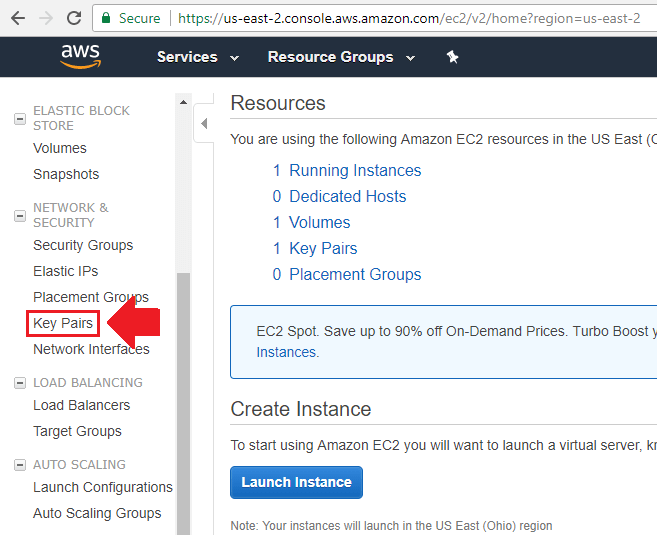 NOTE: To find your EC2 Instance’s public IP address, check out step 1 of this tutorial. 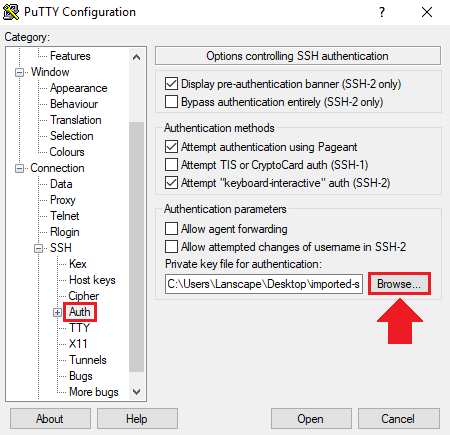 Next, scroll down to the Auth section of the PuTTY sidebar column under the SSH section. Click the Browse button to upload the private key file that you converted in step 2. 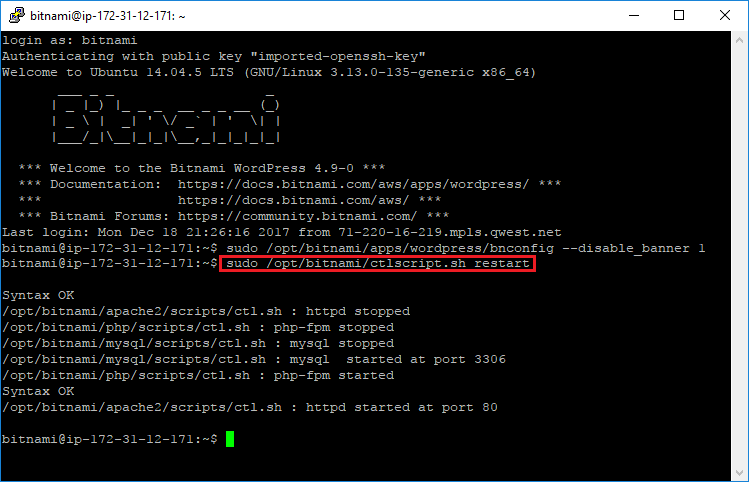 Next, navigate to the Data section of the left-sidebar column, and enter your SSH username – which is Bitnami. Finally, return to the Session section of the left-sidebar menu. Highlight your instance IP under the saved sessions, click the Save button again, then click the Open button. If you are able to SSH into your EC2 instance successfully, you will see a welcome screen similar to the one shown above. Now that you’ve connected to your instance, the next step is copy and paste the command below into the terminal. NOTE: Use the right-click button to paste into putty. After executing the command to disable the corner banner, execute the command below in order to restart your server – this will cause the new changes to take effect. If you’re new to AWS and require a simple solution, you can use CSS to ‘hide’ the banner. Please be aware that although the corner banner is hidden, the script that generates the corner banner will still load with your website until it is properly disabled. You’ve successfully disabled the Bitnami corner banner! If you have any questions or comments about this tutorial, be sure to post them below! Disconnected: No supported authentication methods avaialable. I’ve noticed after downloading the key file the format .pem does not show up when I try to upload in to PuTTY. I end up changing the file extension before uploading as a result. Do you think that could be the reason? Also, I noticed the file you upload is named different that the one that was downloaded is that intentional? I’m just trying to identify if there’s anythign in the directions that’s causing the issue. The purpose of importing the key into PuTTY the first time around is to convert it to .ppk format. Once this is done, save the file as a .ppk file and add it to your PuTTY auth credentials. And you can name the file whatever you like – it won’t affect anything. 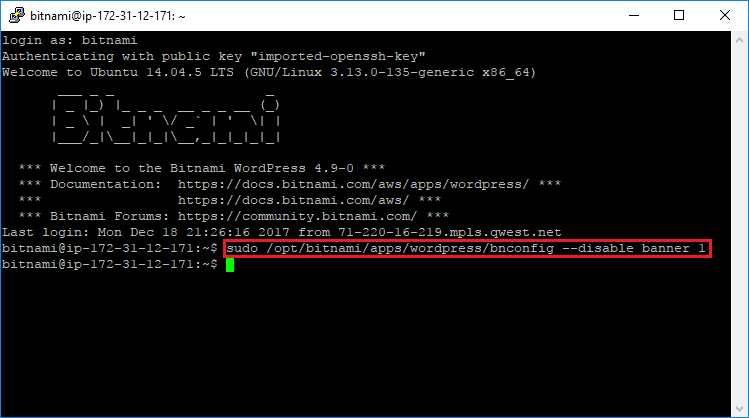 I was able to migrate my wordpress from shared hosting to lightsail and also disable bitnami banner using this tutorial. Thank you! I am signing up for new tutorials. Thanks for the feedback Kwami – I’m glad to hear the tutorials were helpful! Thats it. I followed the rest of the tutorial to include www. prefix. and remove Bitnami Banner. Additionally, Can you please point me to a tutorial for adding Letsencrypt SSL to this wordpress installation? Awesome – thanks for sharing this Prakash! This is worked for me. But this particular tutorial giving errors. Can you give me alternative solution ? For the sake of simplicity, I would recommend just adding the code to your custom CSS. From your WordPress sidebar menu, navigate to Appearance > Customize > Additional CSS. Just paste the CSS code in there. thanks a ton for your tutorial. This is a common issue and unfortunately could be caused by multiple factors. I would go through the tutorial again and make sure that everything is configured properly, especially in steps 3 and 4. 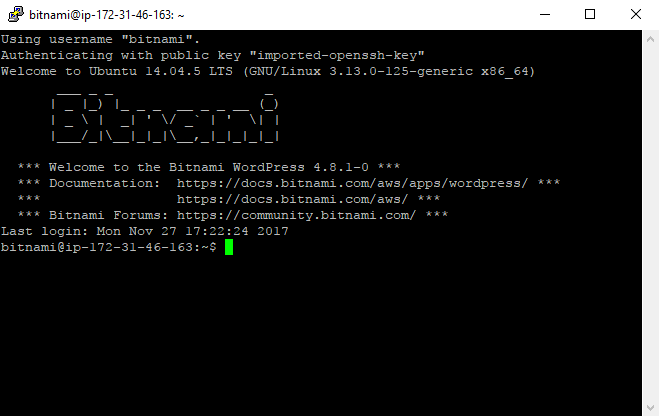 Also, you can remove the auto-login username (step 3) and try “bitnami” or “ec2-user” when you’re prompted in the terminal. Unfortunately, the css method won’t disable the script from running in the background.